Spoiler alert: If you’re reading David Grann’s book “Killers of the Flower Moon: The Osage Murders and the Birth of the FBI” as part of the PBS NewsHour and New York Times’ Now Read This book club, this post contains details about the killers. Stop reading if you want to keep it a mystery. Elise Paschen’s poem “Wi’-gi-e,” came to her so fast, she had to scribble down the words on the back of a magazine before they slipped away. Named for the Osage word meaning ‘prayer,’ the poem was Paschen’s way of tapping into a tragedy to which she feels intimately linked. 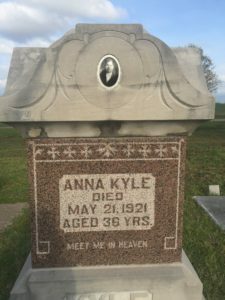 The piece speaks through the voice of Mollie Burkhart, sister of Anna Kyle Brown, the first victim in the “Osage reign of terror” that swept through the Native American community of Fairfax, Oklahoma, in the 1920s. Brown’s body was found at the bottom of a ravine by hunters in May of 1921. While the coroner blamed her death on “whiskey poisoning,” the mysterious circumstances surrounding her death was one of the events that would lead investigators to discover a string of murders. Members of the Osage tribe became overnight millionaires when oil was discovered on their land in Osage County. White men, looking to acquire that Osage wealth, conspired with local law enforcement, doctors, coroners and reporters to carry out the murders of 24 Osage tribal members. William Hale, trusted rancher and “king of Osage County” was found to be the mastermind behind many of the killings. Paschen’s mother was Maria Tallchief, who is recognized as America’s first prima ballerina, and the daughter of oil-rich Osage Alexander Joseph Tall Chief and his Scots-Irish wife, Ruth. She would visit Oklahoma often as a child, and still owns the family home in Osage County, which was left behind when her mother, grandmother and aunt moved to California in the late 1920s. “My family lived in the small town of Fairfax at the time, my mother was born in 1925. My aunt was born in 1926, so these were young children who were born during this most horrific period of Osage history,” said Paschen. Paschen researched the history of the murders extensively, and hoped her work would eventually culminate in a book. After writing the poem and a screenplay based on the Osage murders, Paschen was eventually contacted by David Grann, the author of “Killers of the Flower Moon: The Osage Murders and the Birth of the FBI.” She sent him the poem, which is published in the book. Read Paschen’s “Wi’-gi-e” below, and join the discussion of Grann’s “Killers of the Flower Moon” with Now Read This, a joint book club with PBS NewsHour and The New York Times. Poet and editor Elise Paschen was born and raised in Chicago. She earned a BA at Harvard University and a PhD in 20th century British and American Literature at Oxford University. During her time at Oxford she also co-founded Oxford Poetry. Paschen has published several collections of poetry, including “Bestiary” (2009), “Infidelities” (1996), winner of the Nicholas Roerich Poetry Prize, and “The Nightlife” (2017). She is the editor of “Poetry Speaks Who I Am” (2010) and “Poetry Speaks to Children” (2005), among others, and her work has been included in several anthologies. Paschen has served as the executive director of the Poetry Society of America and she co-founded the Poetry In Motion program, which posts poems in subways and buses. Paschen lives with her family in Chicago, where she teaches in the MFA Writing Program at the School of the Art Institute of Chicago. Left: “I've always been very closely connected to that side of my family, to my Osage heritage, to Oklahoma in particular,” said writer Elise Paschen.